1) He was on the moon all right but the clouds were necessary to hide his blinding brilliance. But perhaps the crowds misunderstood him and expected a great mahima miracle… instead of the vague shape of the Sai afro frizz which can just about be visualised from the moon’s darker area. His afro-frizz can vaguely be seen if one is very willing in the darker parts of the moon – but that is always there on a fullish moon. The Sai official didn’t realise that this was what Sai Baba meant? 3) Or, no less likely, he was there – on the Dark Side of the Moon, together with Pink Floyd and Michael Jackson in Never-never land? (because the moon was not full but showed mostly only a dark face). Slight problem with these explanations? He did not disappear when sitting watching in the wheelchair! Never fear, everyone knows he can easily bi-locate himself… yep, reckon he must be there for he could never tell a lie? 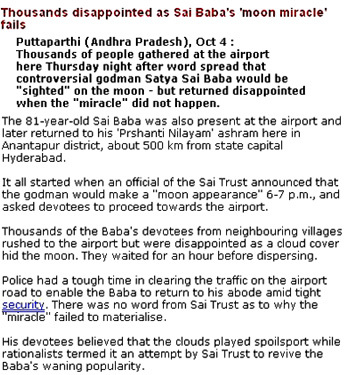 Andhra Café reports that the coming miracle was announced in advance by Sai Baba’s naive servitor, Anil Kumar, and the ensuing scenes were chaotic with Puttaparthi villagers and devotees in thousands chanting Sai Baba’s name and blocking the airport. TV broadcasts were made and, when the allegedly omnipotent and all-knowing Sai Baba did NOT appear on the moon (due to unpredictable weather). Instead he was trapped for about one hour in his car amid the uncontrollable crowds, which also caused closure of the airport. The Vishvarupa Darshanam ceremony has to be “postponed” because, according to Sathya Sai Trust officials, of “non-cooperation of devotees and the cloudy weather”. A postponement means that this miraculous darshan WILL be resumed at some later date! Let’s wait and see… perhaps Sathya Sai Baba will also soon lift a range of mountains, as he has also once announced and published, among many other utterly incredible fantasies? Read more Sai Baba man in the moon mythology here. See how some claim to have seen Sai Baba on the moon anyhow!